We are super excited to announce that Dessy, who by the way we adore just partnered with Cynthia Rowley in order to bring you chick and fashion forward bridesmaid dresses. Design elements will be taken directly from Rowley's eponymous ready-to-wear collection include tulle skirts and drop-waist silhouettes. 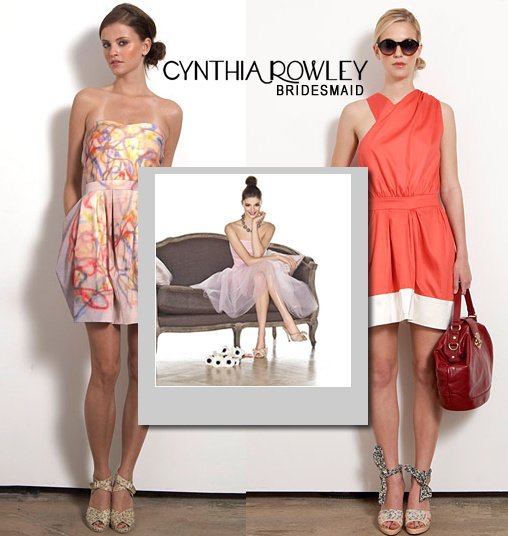 "We wanted to bring a chic sensibility to bridesmaids dresses - a look that is pretty yet sophisticated," said Cynthia Rowley. The line consists of floor and tea length dresses in fabrics such as duchess satin, cotton sateen and tulle. "Rowley's modern silhouettes and rich fabrics are complemented by our signature array of color choices, and are sure to be a centerpiece of any wedding celebration," said Alan Dessy, chief executive officer of The Dessy Group. We are super excited to share the looks with you, so stay tuned. Visit here for more details.